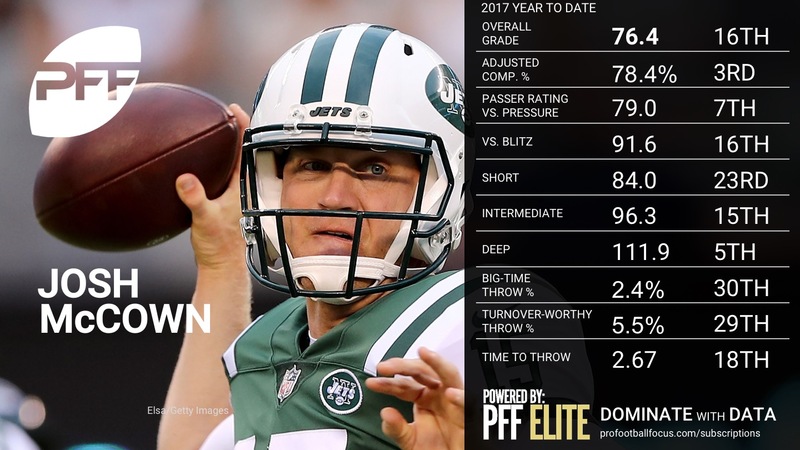 PFF Analysts Steve Palazzolo and Zac Robinson give you an overview of every team’s quarterback, and where they rank in terms of overall PFF grade as well as detailed notes on a select few who stood out for good, or bad, reasons in Week 7. 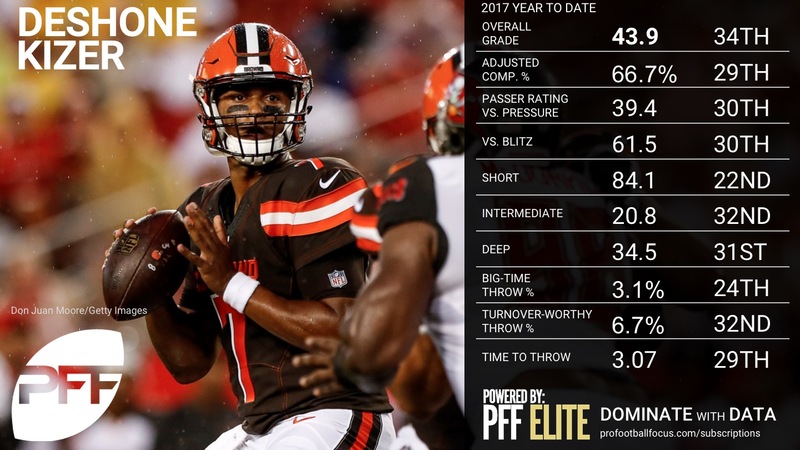 These rankings are based on their overall grades after Week 7, and can be found as a part of the PFF Edge subscription. 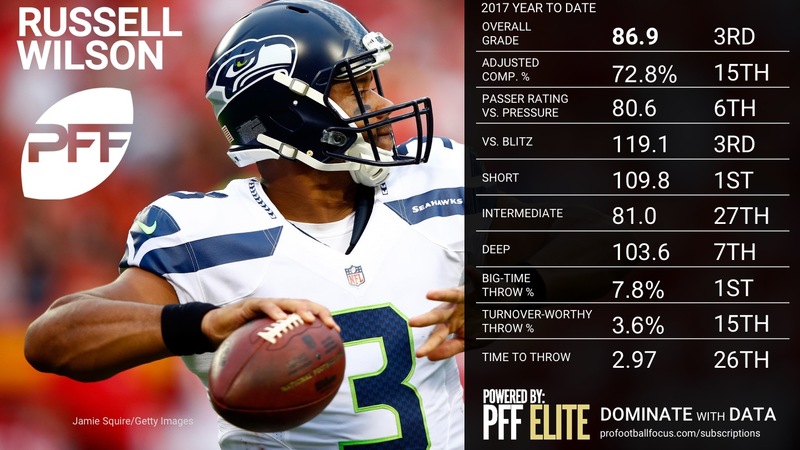 Wilson was sharp throughout, making quick decisions and hitting a few of his typical scramble plays to find completions on a number of key third and mediums. His arm looked as good as it has all season, firing a number of well placed throws up the seams as well as a touch throw up the seam to WR Doug Baldwin versus an all out Cover 0 blitz in the third quarter. There were quite a few yards left on the table for Wilson as he was the victim of four drops, two of which would have went for big gains. 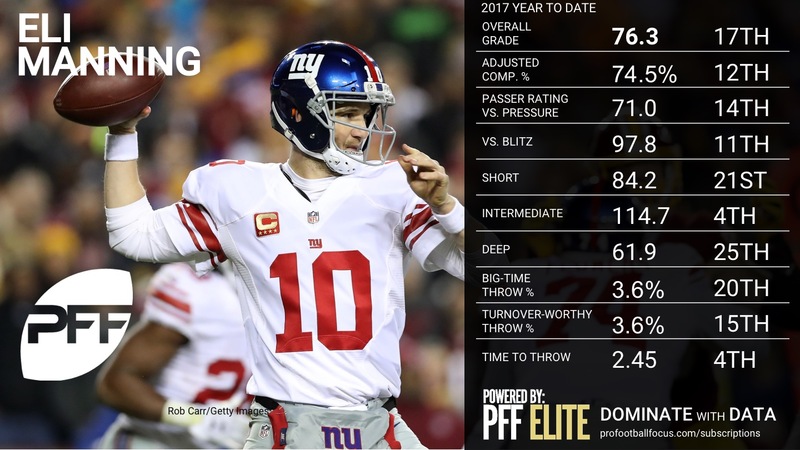 From a clean pocket last week Wilson sliced the Giants up, throwing for 204 yards, three touchdowns and the second best passer rating in Week 7 (139.6). 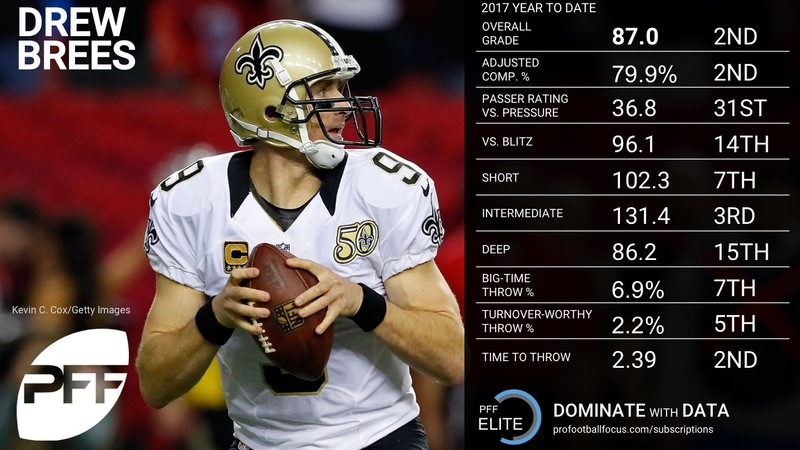 Smith continues to rack up the numbers on the deep ball, as he finished 4-of-4 for 192 yards and two scores on 20-plus yard passes, though it should be noted that his 63-yard touchdown was of the turnover-worthy variety as it was a dropped interception turned passer-rating builder. 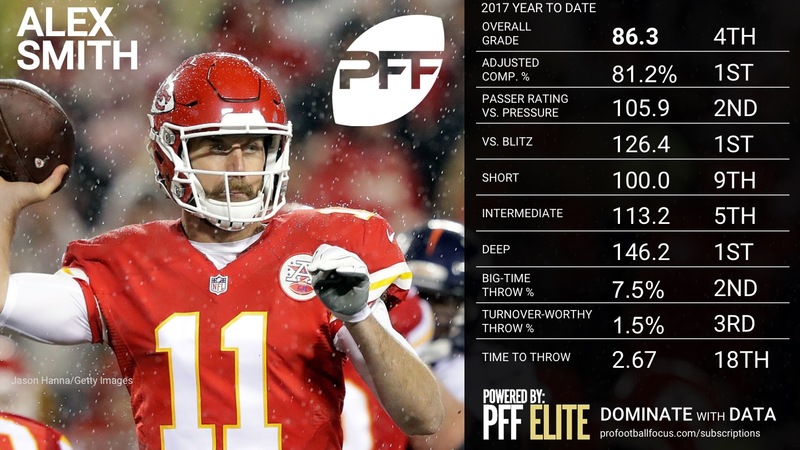 However, Smith still showed his continual evolution from game-manager to play maker with a gorgeous deep pass to WR Tyreek Hill for a 64-yard touchdown. 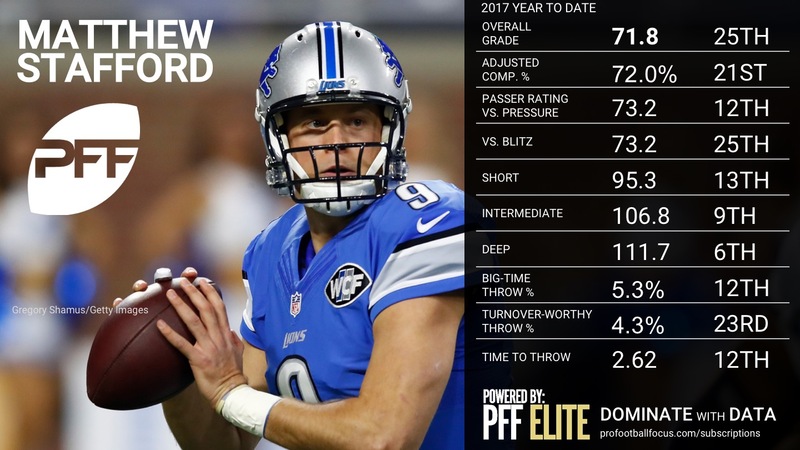 Aside from the dropped interception, Smith took care of the football once again and he now has the third-lowest percentage of turnover-worthy plays in the league. 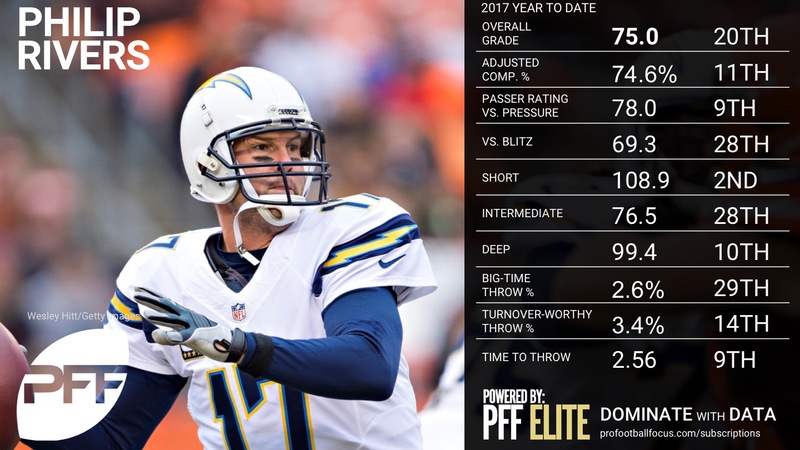 Wentz is the talk of the league after a Monday night performance against the Washington Redskins that earned him PFF Team of the Week status. After an early interception, Wentz hit his stride with an #InStride deep ball to WR Mack Hollins, one of a number of big-time throws on the night. He also hit a beautiful deep crossing route and made perhaps the quarterback play of the season when he broke free from pressure, maneuvered the pocket, and hit running back Corey Clement with a perfect pass along the sideline in the end zone. 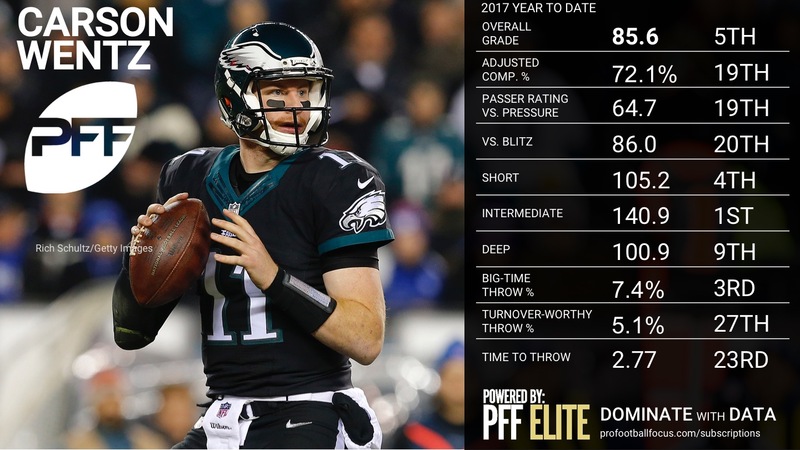 Wentz finished 7-of-13 for 189 yards and three touchdowns on passes thrown at least 10 yards in the air. 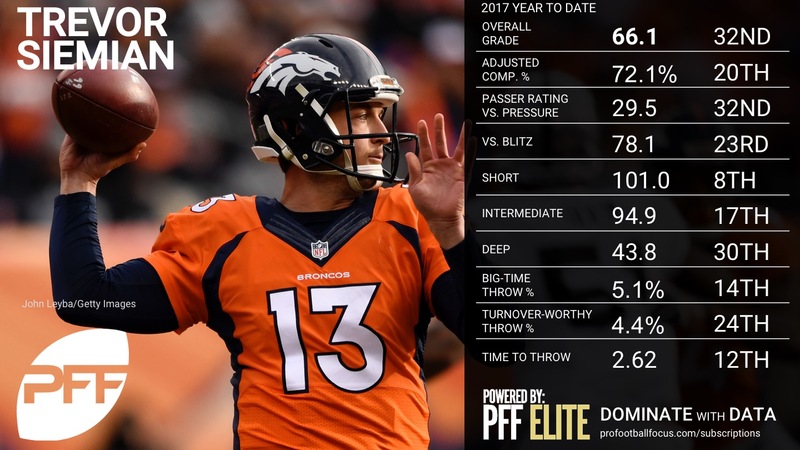 Taylor continues to play at a very high level, playing to his strengths and avoiding any detrimental mistakes, which allows his team to be in position to win close games. Although his accuracy was off a bit early on, he settled in with a few big runs and key conversions on third down, including a deep cross completion to WR Deonte Thompson in tight coverage while taking a shot in the process. 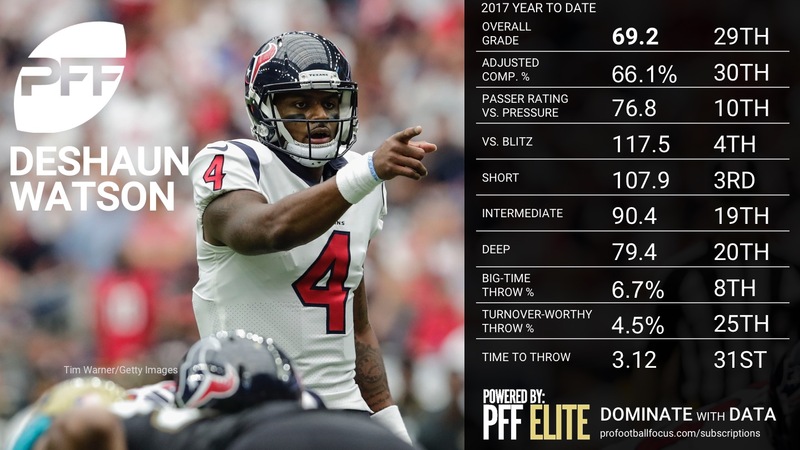 Taylor was fairly aggressive down the field throughout, going 4-of-10 for 116 yards (third-most this week) and a touchdowns on throws traveling 20-plus yards, including his biggest play of the game, when he stepped up through the pocket and found Deonte Thompson yet again for a 59-yard gain that flipped the field and put them in position for a game tying touchdown in the fourth quarter. 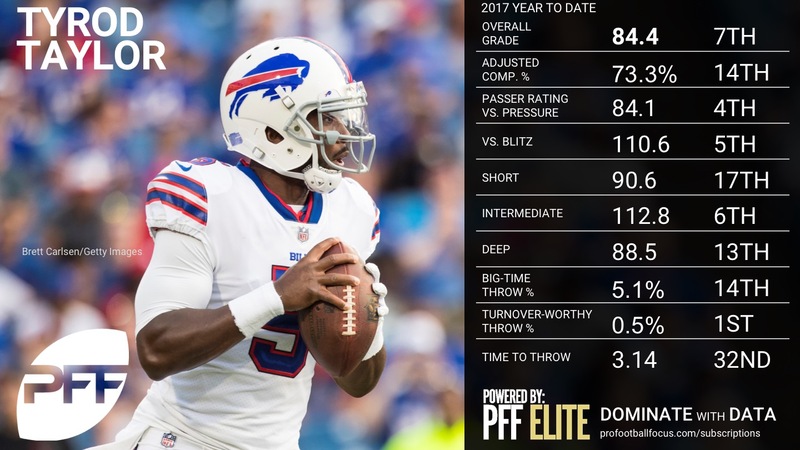 Winston made a number of well thrown, tight-coverage throws early on, and was able to find the creases in the Bills Cover 3 zone defense as he was 12-of-14 for 228 yards and a touchdown versus those looks. 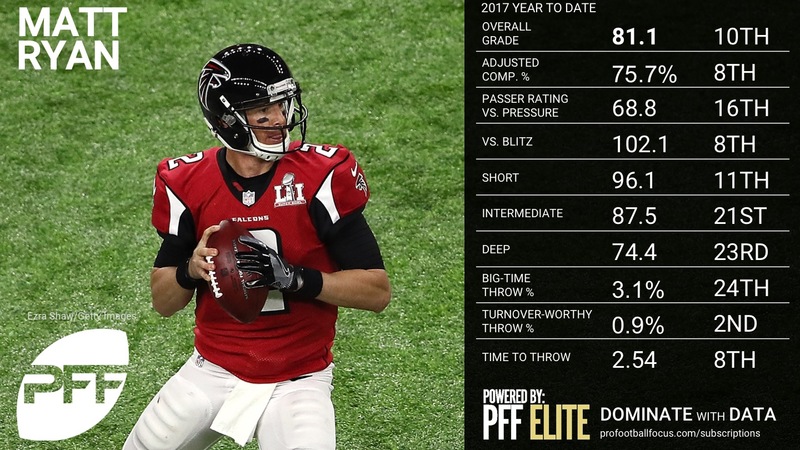 His lone big mistake came at the end of the half when he forced a seam ball into tight coverage with :33 seconds to go in his own territory that was picked by rookie linebacker Matt Milano. Winston’s play in the fourth quarter was impressive, going 12-of-13 for 127 yards and two touchdowns, including the go-ahead score on scramble play to WR Mike Evans late in the game. 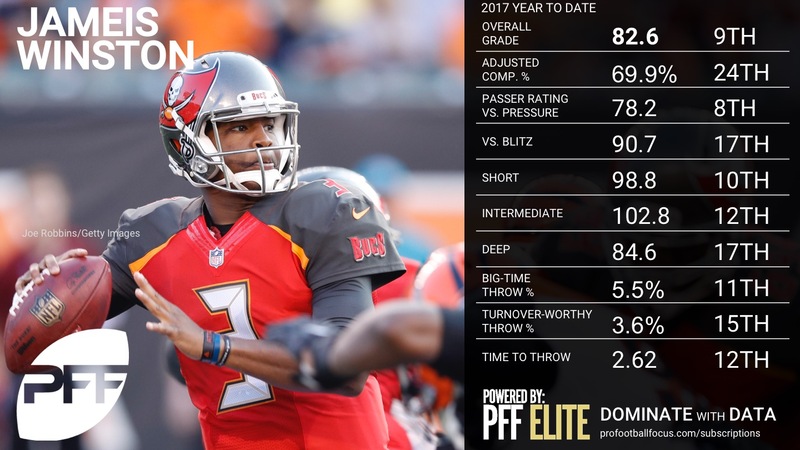 Winston posted the best passer rating under pressure of Week 7 with a mark of 129.2. 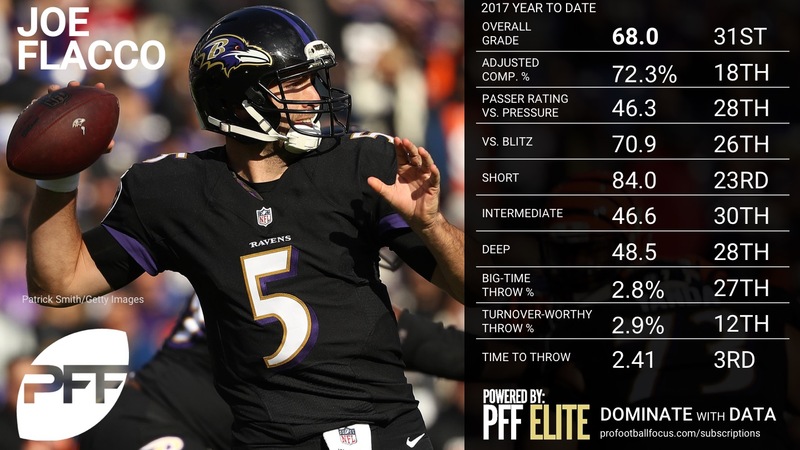 Cousins has played strong football in recent weeks, moving up to 13th overall in PFF grades after a slow start. 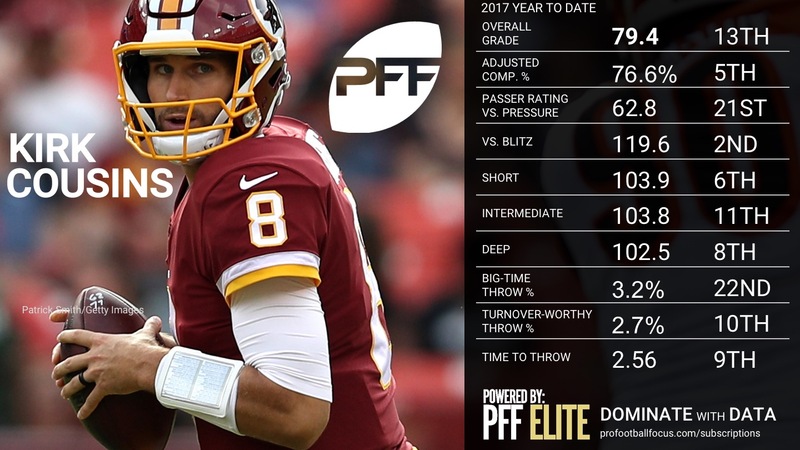 He made good decisions and spread the ball around against the Eagles, finishing 6-of-9 for 151 yards on passes thrown at least 10 yards in the air, but it was Cousins’ work in the pocket that let him down against Philadelphia. 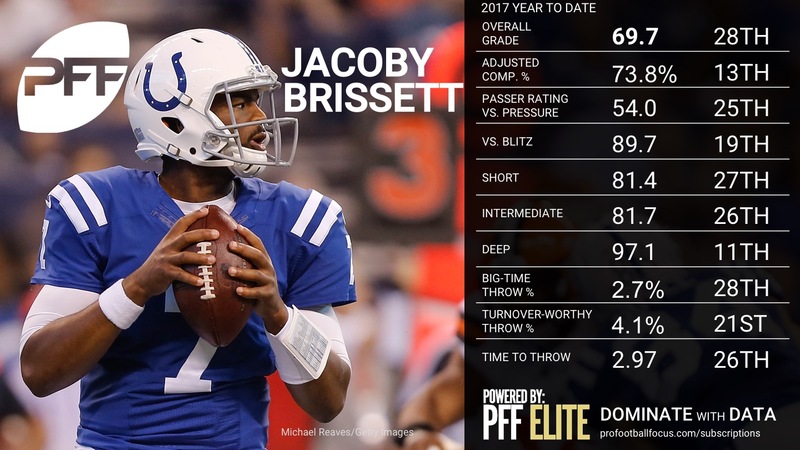 He took an unnecessary sack after rolling out of the pocket and he made a few risky throws with pressure bearing down on him, all adding up to a passer rating of 55.3 when pressured compared to 136.6 when given a clean pocket. 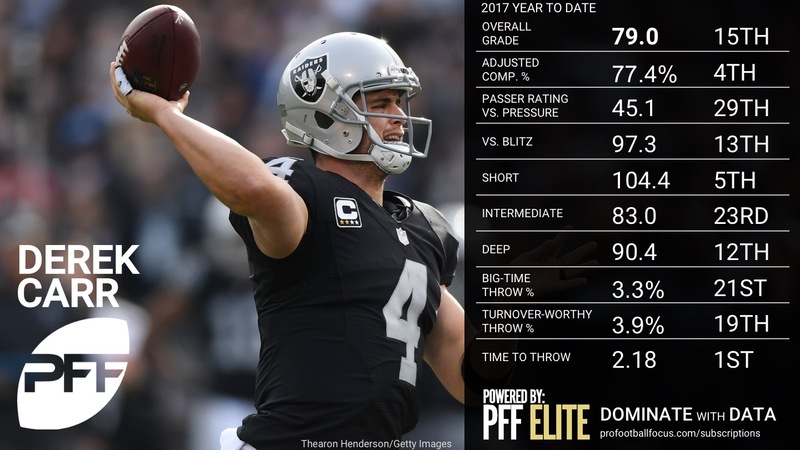 After a few questionable throws early on, Carr settled down and helped lead a much-needed comeback win for the Raiders against the Chiefs. It seemed like he won the game multiple times over in a dramatic last few seconds of the game, but it was his well-placed, game-tying touchdown along the sideline in the end zone that sealed the deal for the Raiders. Carr worked the back-shoulder game well, first to WR Michael Crabtree along the sideline and later to TE Jared Cook to set up the game-tying score. 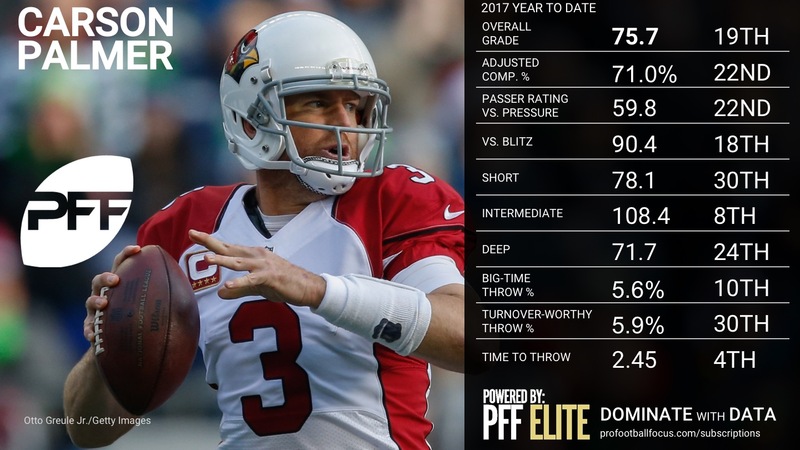 It’s a big part of Carr’s game that must be present for him in order to get back on track after battling injury and a few rough games, but his outing against Kansas City was more in line with what we’ve come to expect. 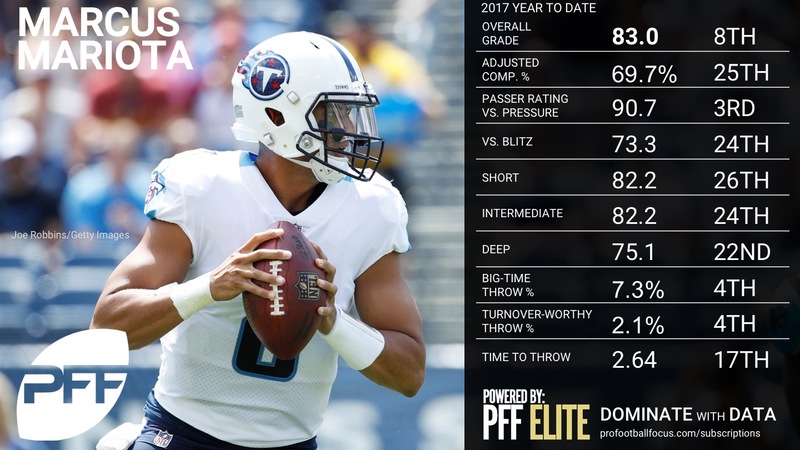 This was perhaps the most consistently accurate we’ve seen Bortles. 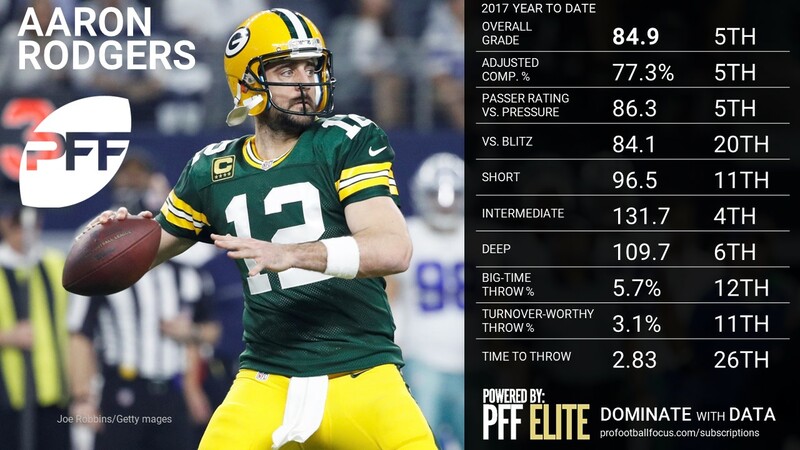 He played in rhythm and found completions at every level, knowing when the time was right to take a shot downfield or check it down underneath. 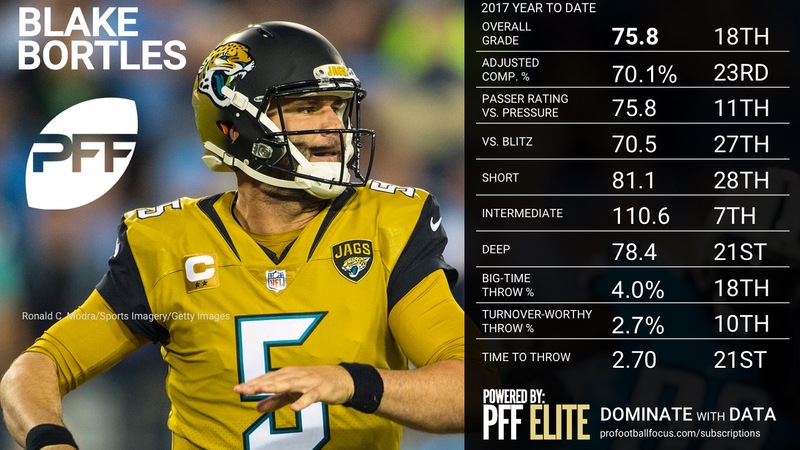 Bortles worked off of play action more than any other quarterback this week, 48.3 percent of his attempts came on play action, and the result was a number of big plays. 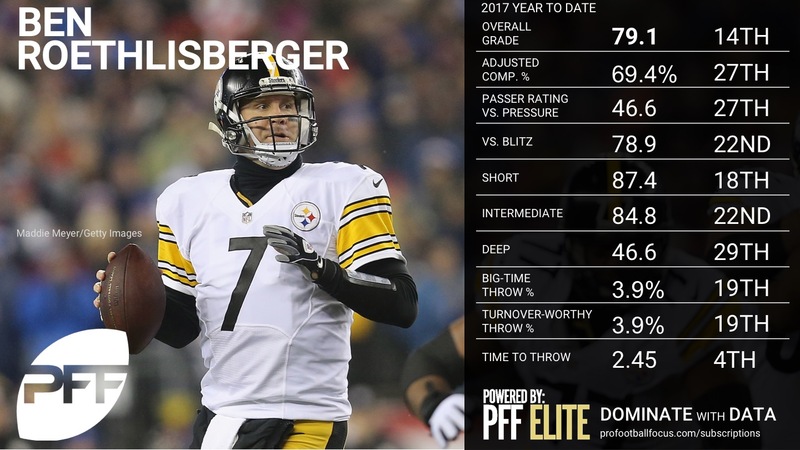 His 15.3 YPA off of play action was tops in the NFL, going 9-of-14 for 214 yards in the process. 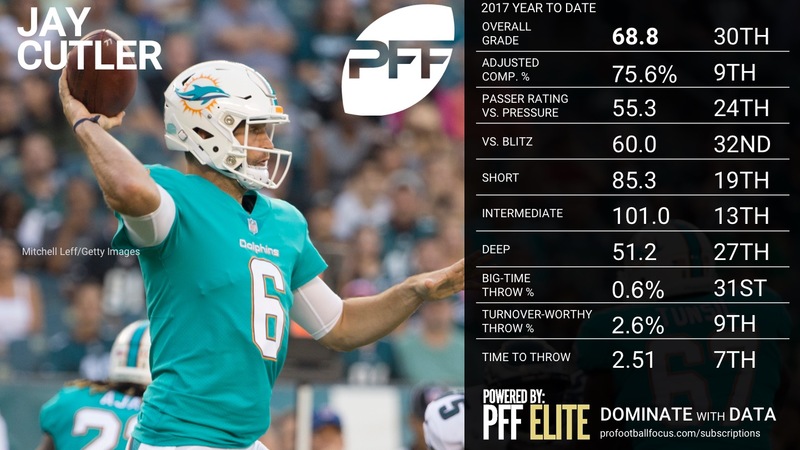 One key area Bortles has cleaned up his play this season is decision-making and accuracy on longer developing plays, especially on scrambles or off of deeper passing concepts. 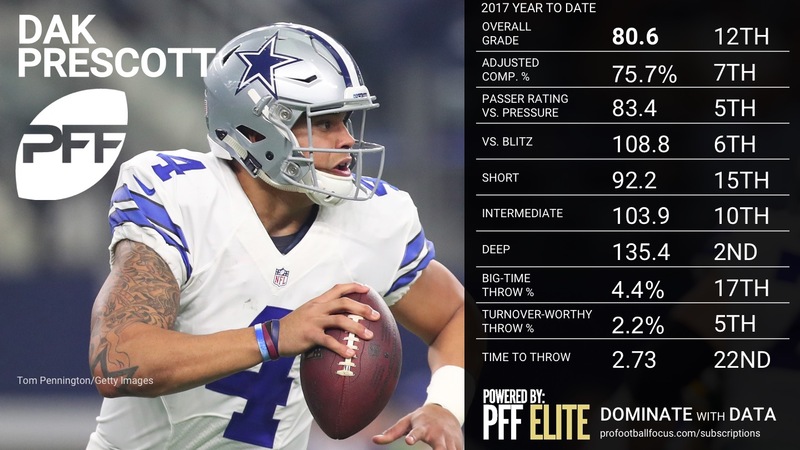 His 99.8 passer rating on throws over 2.6 seconds sit sixth best in the NFL currently, where a season ago his 59.8 passer rating, including 10 interceptions, was last among starters. 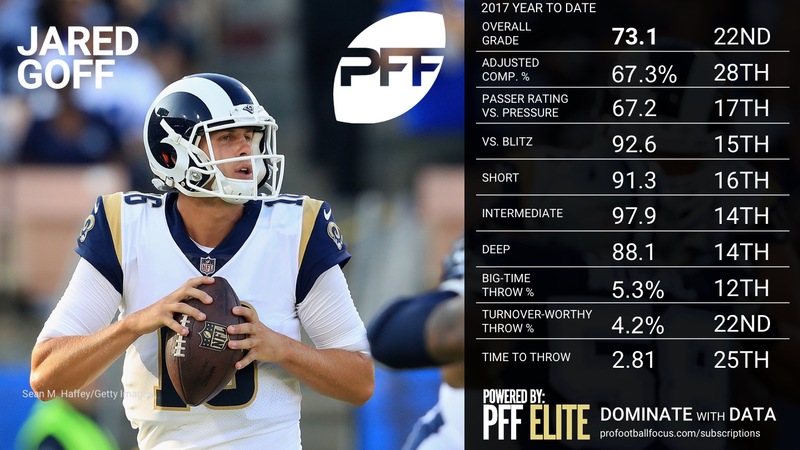 We’re still at the stage where Goff’s second-year improvement is impressive, but we’re also in pump-the-brakes territory as he’s hit a lull over the last few weeks. He’s doing a nice job of spreading the ball around in the Rams’ scheme, showing the quick eyes to get through progressions, but there are still too many throws being left on the table, usually due to inaccuracy. Goff threw multiple dangerous passes of the middle of the field, only one of which was picked, and he had multiple errant passes when throwing off-platform out of the pocket. 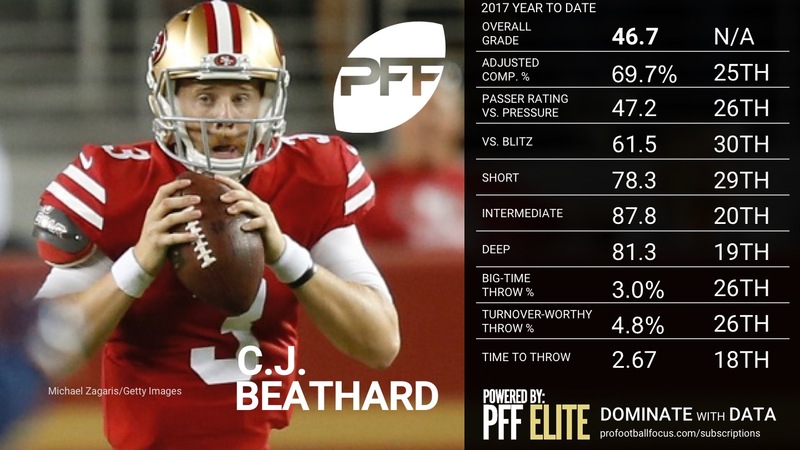 On the day, Goff finished 4-of-11 for 63 yards on passes thrown at least 10 yards in the air. 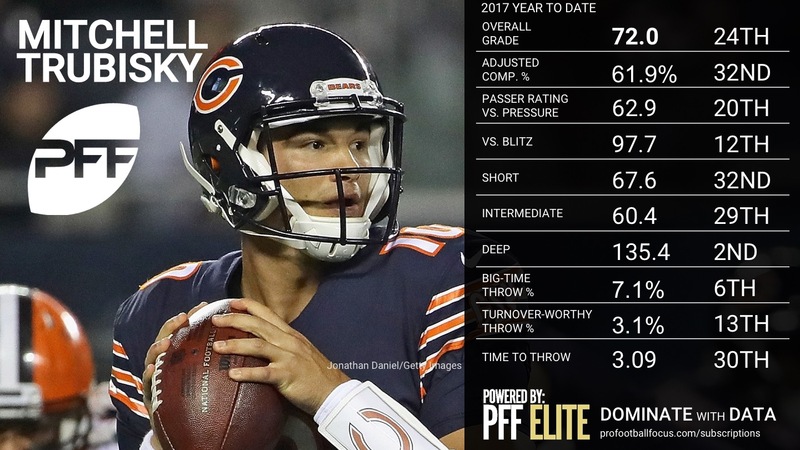 Newton simply struggled to get it to the open man on time and accurately, with the Bears mixing up their defensive looks and throwing him off rhythm. Typically one of the better out breaking sideline route throwers, Newton was late and missed high and wide on a number of occasions in the first half especially. 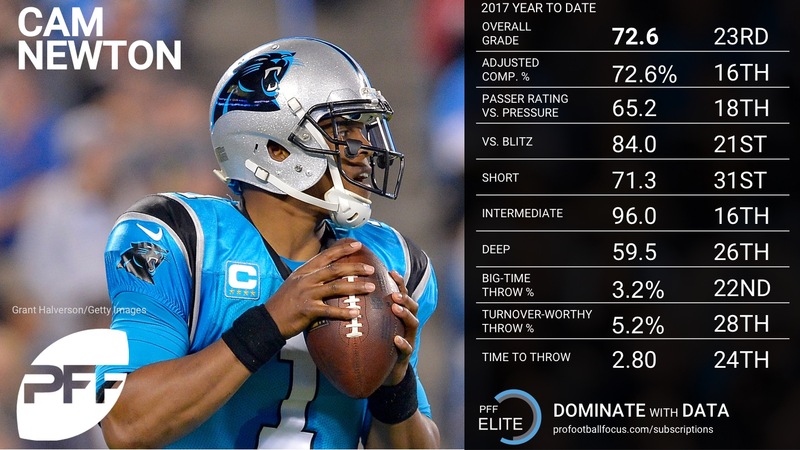 Newton struggled versus man coverage this week, going just 3-of-8 for 26 yards and two interceptions, including a poor decision on a scramble in the fourth quarter that ended any hopes of a comeback. 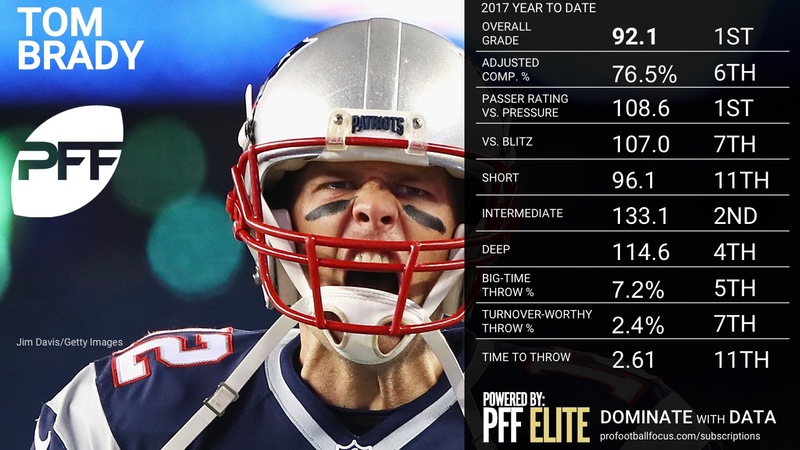 On the season, Newton has the second-highest number of negatively graded throws and is not making enough big time throws down the field to offset some of his misses. 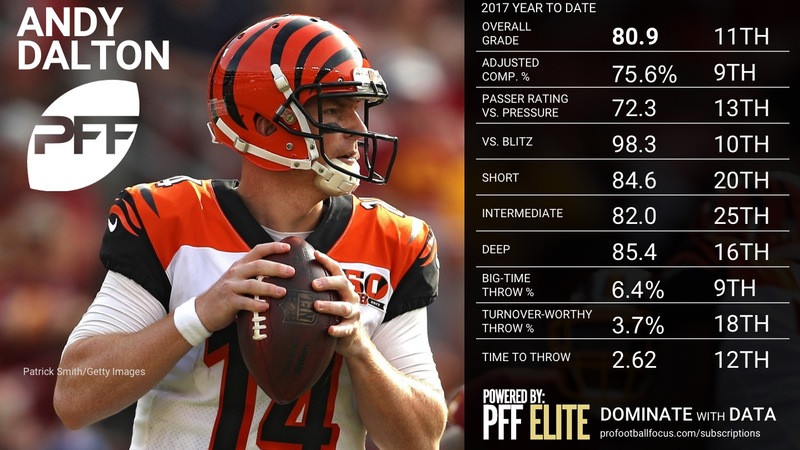 With the expected safe game plan, Hundley’s first start was rather uneventful, relying on the running game, a number of move the pocket plays, and screens to help ease him into action. 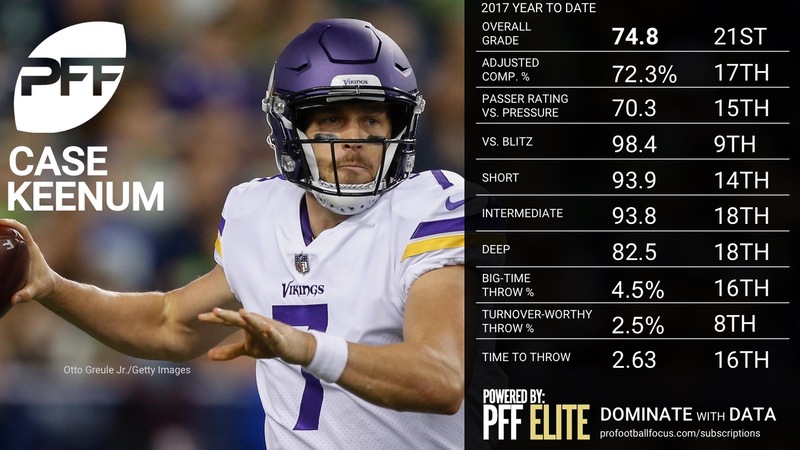 Hundley best play came using his legs and showcased his athleticism, as he scrambled for a touchdown run on a third down inside the red zone in the second quarter. 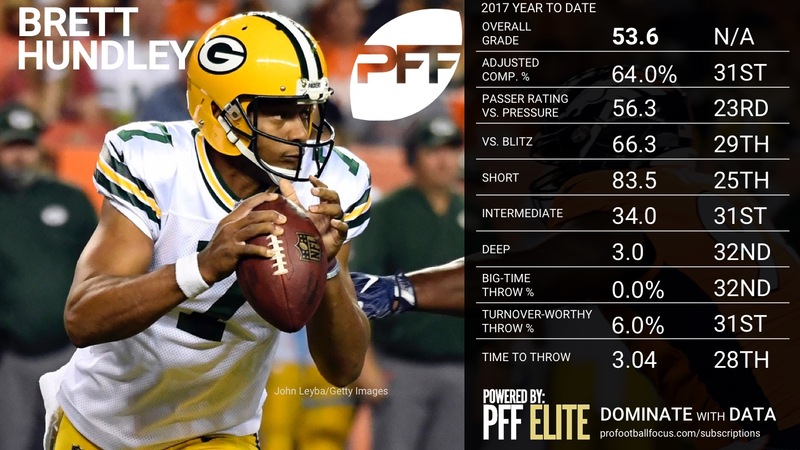 Hundley was just 1-of-5 for 13 yards on throws traveling 10 yards down the field, and he struggled to find any big plays down the field.